Want to play a prank on your favourite couple? Send us your best photo of them. 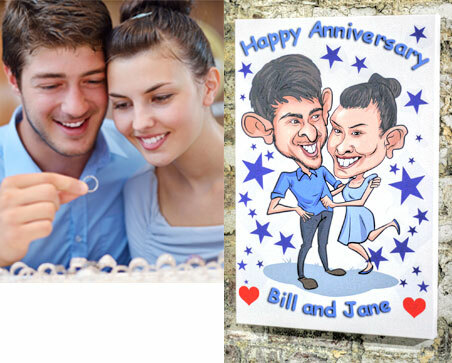 We will have our caricature artist work on the ugliest possible representation of them and print it into a high-quality canvas. It's up to you to deliver the gift with a straight face. If you're a good enough actor, maybe they will put it up in their home. It'll be like your very own sitcom storyline in real life. How will they react upon receiving such a "beautiful gift"? That's a risk you have to take. Here is a sketch from US sitcom "King of Queens" that shows exactly what this gift idea is all about.